These are, no doubt, boom times for New York vegans — especially if you’re the plant-eating type who prefers restaurants over tinkering away with faux cheese experiments in your kitchen — what with the beefless pho, mock-meat tacos, Indo-Chinese Manchurian cauliflower, vegan junk food, and so on proliferating around the city. In a sign of the times, if there was any, new-school cafés take inspiration from diners while going heavy on vegetables. Still, maybe you were thinking to yourself recently, “I want my mapo tofu vegan and my dan dan noodles, too.” You may not have known where to go, and decided to go back to Buddha Bodai for dim sum, but now there’s an answer. 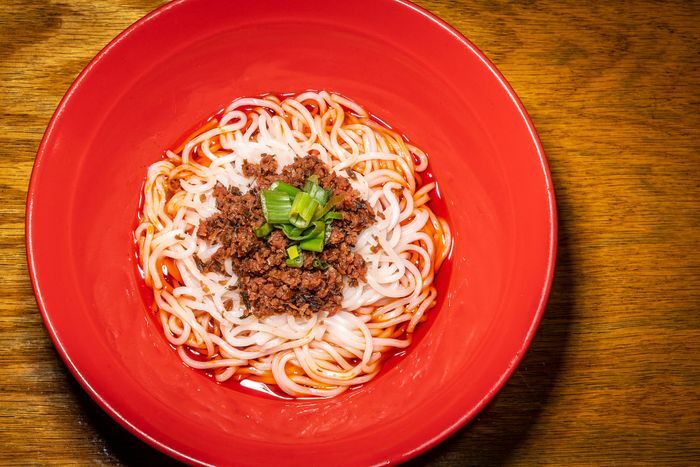 Over in the East Village, Sichuan food has been given a meatless makeover at the tiny, Sichuan peppercorn–powered Spicy Moon. Quietly opened on East 6th Street in January, Spicy Moon was packed on a recent Friday, with people biding their time in the cramped but lively space for chili wontons and cumin tofu. Previously, the storefront was home to a ramen spot called Zen 6, which was bought by Spicy Moon’s owners last fall and then converted into the new restaurant in January. Still, they went for it, testing different vegan versions of things like oyster sauce, and opting to create what Nick calls a “pretty basic” menu. (They do use some newfangled products, making mountain-yam puffs with vegan cheese and turning beyond beef into meatballs.) The space itself looks more Mission Chinese than Szechuan House, which comes through at night when it’s splashed in red light; there are blonde wood tables, a few tall plants, and walls decorated with old photos and local art. When you sit down at your table, you’re presented with a menu that’s dim sum–esque (the check boxes) with a millennial (pink) makeover. As for the menu itself, it covers a lot of Sichuan standards, dishes you might miss if you went from bingeing on twice-cooked pork to tinkering with your twice-cooked yuba. 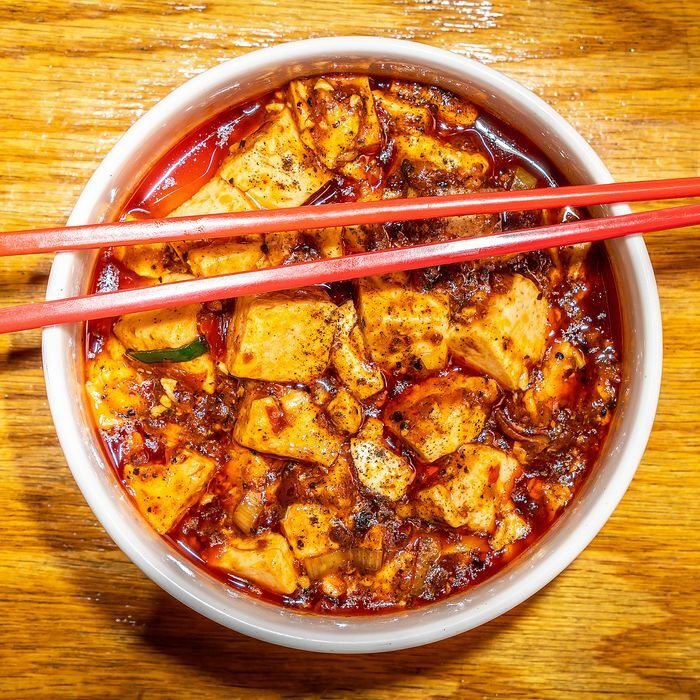 There are dan dan noodles, cumin-style tofu, a vegetable or tofu dry pot, and of course mapo tofu. 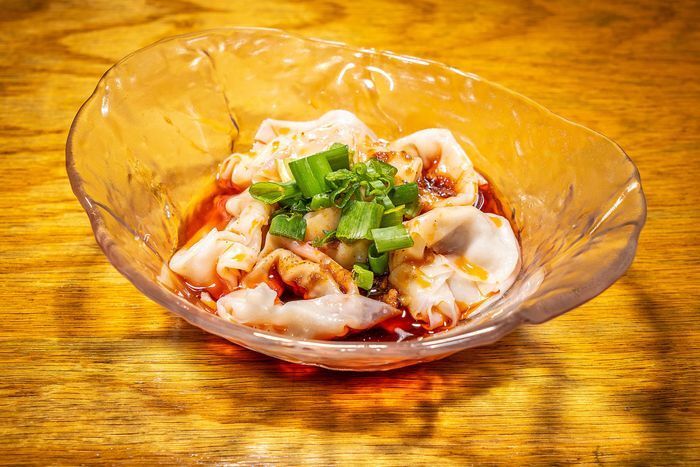 The vegetable wontons in chili oil stand out for being a particularly good representative of the classic (most famously served in New York at Flushing’s White Bear), and were the highlight of a recent meal. Other dishes are versions of Chinese-American standards, like the General Tso’s mushroom (breaded, fried, and nugget shaped, with a dipping bowl of sauce), the cold sesame noodles, and a flaky scallion pancake. While standards make up most of the menu, there are also less conventional items like the fried pickles with “Szechuan sauce” and cumin fries seasoned with the namesake spice, Sichuan peppercorn, and salt. 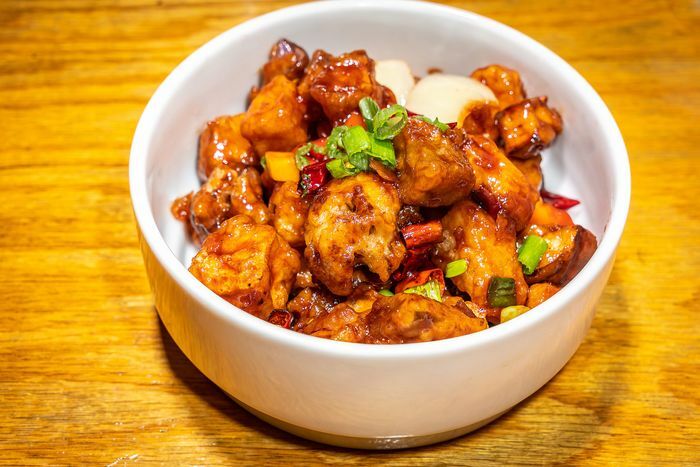 That dish is definitely not a Sichuan classic, but you might recognize it from one of the city’s best Chinese restaurants, Little Pepper. 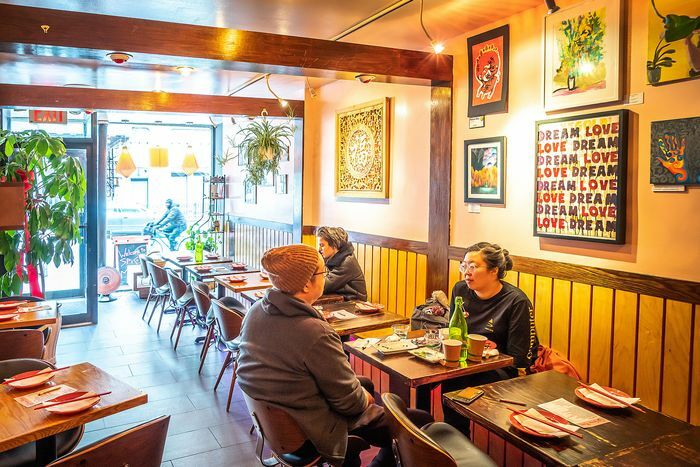 Those little eccentricities make Spicy Moon a more interesting place, and show the owners are trying to bring something else to the city’s fast-expanding universe of vegan restaurants.